GARMEN lies within a region bounded by 03 mountain massifs:PIRIN,RHODOPES and RILA slightly more to the North. With a surface area of 2585 km2 and more than 50 peaks at 2000 meters with peak Vihren 2914 m, giant Scots pine forests,mountain lakes,PIRIN,protected as Natural National Park,inscribed on the World Heritage list of UNESCO since 1983,will delight lovers of the medium and high mountains with its countless hiking trails and shelters. You can also practise skiing in Bansko. PIRIN extends to the South by Slavyanka massif which a part (called Reserve Alibotouch) is listed on the list of the UNESCO Biospheres.This massif is also partly located on Greek territory. This region of hills and medium mountains,vast,15000 km2,will enchant you by his wild side,its colours,its remote villages. DEVIN mineral water swimming pools,the Gorge of devil of Trigrad, the cave of Yagodina, the wonderful bridges,the Lake of Trigrad,you'll do a crossing in a natural environment that will leave you deep memories. Located between Sofia and Garmen,this mountain range is the largest National Park of Bulgaria,with a surface of 2629 km2 and has 100 peaks over 2000 meters including Mount Musala,which culminates at 2925 meters,the highest peak in the Balkans. In addition to hiking as the famous Seven Lakes trail,RILA is also home to The monument to visit during a visit to Bulgaria: the RILA monastery. A visit to the pyramids of Stob will be a very pleasant excursion along a trail on the ridge. -Route 1: to Ossenovo,passing through the village of Srebatno. -Route 2: to Kovachevitsa,via Lechsten and Gorno Dryanovo. 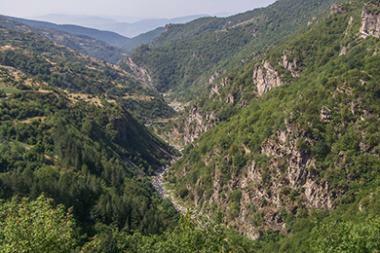 -Route 3: to Melnik via the pass of Popovi Livadi. -Route 4: to Delchevo,via the town of Gotse Delchev. Between the villages of LECHTEN and KOVACHEVITSA,you can descend into the Gorge and swim in the Kanina River or in the Blue Waterfall. -to browse through the coast of the Aegean Sea between Kavala and Thessaloniki and its many sandy beaches. This coast has several important resorts such as NEA PERAMOS,some very pleasant private beaches, like Batis,but you will also find along the way deserted beaches or upgraded with paillottes and beach bars. -Tassos Island:from the port of Keramoti (or Kavala) you can easily reach the island of Tassos after 30 minutes by ferryboat.